Home Medical Entrance Exams MP MBBS Admission 2018 – Registration Started!! MP MBBS Admission 2018 – Registration Started!! MP MBBS Registration 2018: To participate in the counselling for admission to undergraduate Bachelor of Medicine and Bachelor of Surgery (MBBS) programme in the Government and Private college of the state Madhya Pradesh, aspirants, first of all, need to apply and attend for NEET UG 2018. After this, they need to register and apply for admission. There are total 18 colleges in Madhya Pradesh who offer admission into MBSS programme. 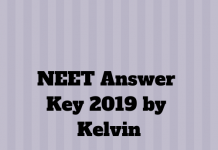 Admission to the participating college is based on the NEET 2018 exam score. Directorate of Medical Education, Madhya Pradesh, the official counselling conducting body, will release the application form for the eligible candidates on 15th June 2018. The applicants can fill up the MP MBBS 2018 application form online until 25th June 2018. Those candidates who possess the eligibility criteria, only they are allowed to apply for MBBS Admission 2018. The candidates must follow the below given steps to apply for MP MBBS Admission 2018.